Kenan Trebincevic was born in a town called Brcko in 1980 to a Bosnian Muslim family who was exiled in the Balkan War. He came to the United States in 1993, went to college in Connecticut and became an American citizen in 2001. He works as a physical therapist in Greenwich Village and lives in Astoria Queens, amid 10,000 other former Yugoslavians. His work has appeared in The New York Times Magazine, The Wall Street Journal, New York Times Op-Ed page, Esquire, The International Herald Tribune, Salon.com, on American Public radio, and in the Best American Travel Writing Anthology 2012. 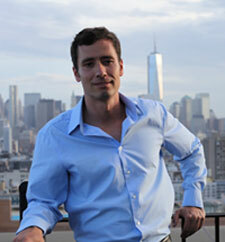 His memoir THE BOSNIA LIST, coauthored with Jewish journalist Susan Shapiro, will be published by Penguin in February 2014. At age eleven, Kenan Trebincevic was a happy, karate-loving kid living with his family in the quiet Eastern European town of Brcko. Then, in the spring of 1992, war broke out and his friends, neighbors and teammates all turned on him. Pero - Kenan's beloved karate coach - showed up at his door with an AK-47 - screaming: "You have one hour to leave or be killed!" Kenan's only crime: he was Muslim. This poignant, searing memoir chronicles Kenan's miraculous escape from the brutal ethnic cleansing campaign that swept the former Yugoslavia. After two decades in the United States, Kenan honors his father's wish to visit their homeland, making a list of what he wants to do there. Kenan decides to confront the former next door neighbor who stole from his mother, see the concentration camp where his Dad and brother were imprisoned and stand on the grave of his first betrayer to make sure he's really dead. Back in the land of his birth, Kenan finds something more powerful - and shocking - than revenge. THE BOSNIA LIST will be published by Penguin in February 2014. Between 1992 and 1995, a war savaged the country that was once known as Yugoslavia. Violence and destruction ripped through the fabric of the society, tearing apart families, eliminating villages and laying waste to the innocence of children. The International Criminal Tribunal for the former Yugoslavia estimates that 104,732 people died during the conflict, with many more forced to flee the country. Some eventually returned, but others were perpetually haunted by an Odyssean yearning for their homeland. One of those exiled was Kenan Trebincevic. He was 11 years old when his life changed forever. His home, Brcko, a northern Bosnian town, was one of the most dangerous places in the country. Overrun early by Serb and paramilitary forces, it became an important corridor that linked two pieces of Serb-held territory. By the end of the war, it was a skeleton: the picked-over remainsof a once proud and ethnically diverse community. When the Bosnian civil war approaches the small town of Brcko, the life of 11-year-old Kenan changes overnight. His teacher holds him at gunpoint in the middle of the street, his Karate coach shuns him and his next-door neighbor loots his family's belongings from their home. All the other Muslims have either fled, been sent to concentration camps or been killed. His family ("the last Muslim family in town") eventually are forced to run for their lives. Now, 20 years later, Kenan's an American citizen living in Queens, New York, and honoring his aging father's wish to revisit their homeland-but only because he seeks revenge against the people that wronged his family. With the assistance of writer Susan Shapiro, Kenan tells his harrowing story in two compelling narratives: One that captures his war-torn childhood, the other that traces his surprising journey home. Yes, Kenan searches to confront old enemies, but what he finds instead are "flickers of goodness that must be remembered." That the most significant parts of his life in Bosnia, he rediscovers-and re-remembers-were not filled with hate, but rather filled with "exactly enough" love-the people that helped him and his family survive. A poignant, powerful look at forgiveness. Yugoslavia's descent into war and genocide more than two decades ago has been the subject of outstanding scholarship, journalism, and biography. Trebincevic's account contributes to this literature in an unusual way. The author blends his childhood experience of Bosnia's tragedy with a return to his original home in Brcko after nearly 20 years in the United States. The titular list is of goals the author intends to accomplish. They include seeking out surviving friends and relatives as well as confronting Serbs guilty of crimes against Trebincevic's defenseless Muslim family. The great irony of the narrative consists in the list's gradual transformation into an enumeration of Serbs who rendered critical help, enabling the family's survival and flight. Far from being a tale of exoneration, the author's story is one that reveals the power and limitations of memory, the poignant complexity of human relations in battle, and the catharsis of understanding past betrayal and sacrifice. VERDICT: Combining themes of war, childhood, and return, this memoir is for readers interested in the human drama of brutal conflicts and social dislocation. Knowledge of Balkan history is not necessary. "...Although the descriptions of his family's experiences during the war are gripping, the power of the book comes from the evolution in Trebincevic's thinking and emotions as he moves through his anger and revenge fantasies. "I'm so glad I got an opportunity to read The Bosnia List... Complex, nuanced, tragic, and joyful, it is a book that will make you ponder your own good fortune and think about the nature of diversity, horror, and compassion. Mr. Trebincevic tells the story of his family's life in Brcko before the war, during the war, after their escape, and upon their return. With an understandable mix of emotions, Mr. Trebincevic is wary about returning, but does so to honor his father's wish to see his home again before he dies. Armed with a list of wrongs, people and places he wants to confront, and a lot of well-deserved anger, the author works his way through his list and finds a situation more complex than he had imagined and comes away with feelings of reconciliation and compassion. I admire him a great deal for the latter. I can't imagine how one reconciles with neighbors who stole from you, threatened you, killed people who looked like you, but the author's example inspires me to continue talking to people and hearing their stories. It's when we lose sight of the grays in the world and huddle in the black and white that we begin to lose our humanity." When Trebinevic was 12, he fled with his family from their small town in the former Yugoslavia, driven out at the threat of death by the ethnic cleansing of Muslims. His childhood buddies, even his beloved karate coach, turned against him. His father and older brother were briefly imprisoned in a concentration camp. The neighbors slowly stole precious items from his mother. From the safety of adulthood in the U.S., Trebinevic is reluctantly drawn back to his homeland when his aging father longs to return for a visit. If he must go back, he wants some revenge and some closure. On his agenda: confront his neighbor, stand on the grave of his former coach, leave flowers at his grandmother's grave. Trebinevic alternates memories of his childhood and of his life in the U.S. with its edgy attempts to get along with Serbian Americans. In Bosnia, he faces the jarring complexities of people, including himself, coping with atrocities as he finally begins to put away old resentments that have haunted him. A mesmerizing story of survival and healing. Nearly 20 years after fleeing their war-ravaged country with his parents and older brother ("the last Muslim family in town"), Trebincevic returned to his hometown of Brcko, Bosnia with vengeance in his heart, yet he found there a different kind of reckoning. In this astute account, co-authored with Shapiro (Five Men Who Broke My Heart), is readably organized and evenhanded. Trebincevic alternates narrating his admittedly reluctant journey back to Bosnia with his father, now in his 70s, and brother, Eldin, in July 2011, with his reconstruction of the outbreak of war in March 1992 when the author was 11, Bosnia-Herzegovina had declared its independence from Yugoslavia, and the well-armed Serbs launched a bloody campaign of "ethnic cleansing" against the majority Muslims in the country. Trebincevic and his family were blindsided by the violence, since the diverse ethnic groups had lived in harmony for decades, yet seemingly overnight had to contend with neighbors and teachers hurling ethnic slurs. The family eventually escaped to Connecticut, yet the bonds of loyalty and treachery were so complex and scarring that even after having made his career as a successful physical therapist in Queens, N.Y., Trebincevic, now 30, wrote out a list of scores to settle when he agreed to accompany his father and brother back to their hometown. The great instruction of this important work is the author's moral transformation that helped him replace hate with grace, if not forgiveness. 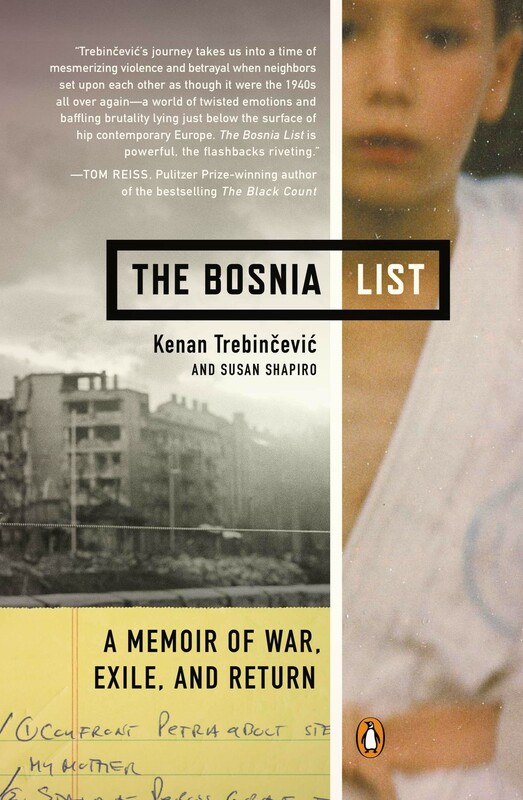 Spring Books You Shouldn't Miss: We're excited about THE BOSNIA LIST: A MEMOIR OF WAR, EXILE, AND RETURN by Kenan Trebincevic & Susan Shapiro. Penguin. Having been forced from his Bosnian hometown in spring 1992, when former friends and neighbors turned on him and his family because they were Muslim, Trebincevic made it to America. He returned recently with revenge in his heart, but something different happened. I'm so blown away by this beautiful book. For the first time, a young Bosnian tells a riveting coming-of-age story about the brutal Balkan war when parents disappeared into concentration camps, teachers turned on students and children betrayed children. Two decades later, now an American citizen, Kenan returns to his homeland to confront the guilty and honor the dead in this passionate, nuanced account of a man who refuses to forget. Human rights journalist and author of "Sisters: Lives of Devotion and Defiance"
Kenan Trebincevic's story of survival and remembrance is moving, well-told, and important for all of us to hear. He makes a powerful case for courage and human decency as the only way through the divisive madness of modern life. Ian Frazier, bestselling author of "Travels in Siberia"
The Bosnia List was difficult to finish because it touched me so deeply. I've wondered how another Bosniak could describe their tragedy and traumas, watching the transformation of former friends and neighbors becoming animals. Most powerful was how Kenan's mother's voice echoed in his head and became his morality, preventing him from getting revenge. She's one of the strongest, best described female characters in Bosnian literature. And I was rooting for Kenan's father not to succumb to evil and stay a good man. That might be why his family survived. That shows us all: if we stay good, we have a chance. Dr. Esad Boskailo, Psychiatrist, Bosnian war survivor, and co-author of "Wounded I Am More Awake: Finding Meaning After Terror"
With the assistance of Shapiro (Journalism/The New School; Unhooked 2012) Trebincevic returns to the scene of childhood trauma during the Bosnian War of the early 1990s. The author fled the bloody civil war in his native Bosnia in 1993 with his father, mother and older brother, Eldin, and settled in Connecticut. Just 11 years old when the war broke out, the author observed the sudden hostility of the Serbs toward him and his family, native Muslims, as ethnic tensions flared in their diverse town of Brcko and the Muslims were persecuted in the name of Serbian supremacy. His revered karate coach turned a cold shoulder to him, the family's bank account was depleted, his favorite teacher spat at him on the street ("Everything he'd ever taught me about brotherhood and unity was a lie"), the shopkeepers taunted them, and, most haunting for the boy who could not protect his mother, their neighbor, Petra, gradually appropriated their furnishings and clothes since, as she assured his mother, "You won't be needing that carpet." When the author's father, now in his 70s, a widower since his wife died of cancer, resolved to return to Bosnia in 2011 for a visit, the author and his brother had to swallow their pride and go with him, with enormous trepidation. At 30, the author was "startled by the intensity of his fury" when imagining how he would return to his tormentors. Indeed, he drew up a list of grievances to attend to during his visit, including confronting Serb classmates and friends who had turned the family in, especially Petra, peeing on the karate instructor's grave, and visiting the concentration camp where his father and brother were imprisoned. Yet immersion in his homeland and being bombarded by the new reality challenged his vendetta in surprising ways. An engaging memoir of war trauma and the redemption to be found in confronting it. A young New Yorker haunted by searing memories goes on a most unusual overseas vacation – not to sightsee or party but to confront the ordinary men and women who tore his family's lives apart. His journey takes us into a time of mesmerizing violence and betrayal when neighbors set upon each other as though it were the 1940s all over again – a world of twisted emotions and baffling brutality lying just below the surface of hip contemporary Europe. The Bosnia List is powerful, the flashbacks riveting. Tom Reiss, bestselling author of the Pulitzer Prize winning "The Black Count"
David Margolick, bestselling author of "Elizabeth and Hazel: Two Women of Little Rock"
The Bosnia List tells a fascinating story of a harrowing and heart-rending journey. It's a graceful, taut memoir of family, friends and faith: a moving recollection of souls being torn asunder and slowly beginning to heal. Laurence Bergreen, bestselling author of "Columbus: The Four Journeys"
Tom Zoellner, bestselling author of "A Safeway in Arizona"
An estimated 100,000 people died during the ethnic cleansing of Bosnia-Herzegovina in the early 1990's, but few Americans grasp the insanity of the conflict. Kenan Trebincevic, a Bosnian Muslim, was 11 when the fighting broke out. He describes how lifelong friends turned on his family, how his brother and father were thrown into detainment camps, and how they eventually fled under nightmarish conditions. He also takes us on a trip home to complete his titular to-do list as he confronts the betrayers and attempts to make sense of the nonsensical. Kenan on The Story describing his experiences during the Yugoslavian conflict and revisiting his hometown nearly twenty years later. NY One's "Inside City Hall"